Fourth Anniversary Four Rewards! Ultimate reward: Participate in the Buyandship Lottery and win phenomenal prizes! 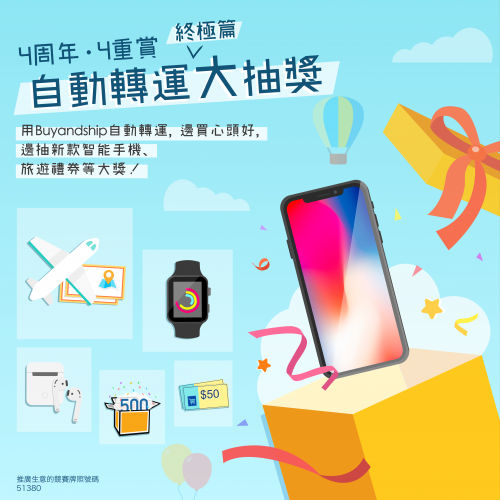 We want to celebrate our fourth anniversary with our Buyandship members by offering a Buyandship lottery with prizes with a total value of over HK$33,000! Participating is very simple: As long as you are a Buyandship member, and you have chosen the “Single shipment” for your orders from US, UK, Japan or Korean shipments between December 1, 2018 and December 31, 2018, then you are automatically eligible for our lottery. No need to register, no need to fill in any questions, super convenient! Special guest: This time, we invited our very cute and fluffy Buyandship teammate – our office cat Char Siu be the guest of honor! If the winners want, they can definitely take a photo with her! Reminder: Regardless of the number of shipping orders, each person has only one chance to participate. That is to say, if the same person has more than one Buyandship account and the wins more than one award, they will only receive the higher level award!